Hiab, part of Cargotec, recently previewed its new and innovative crane Hiab X-HiPro 1058 at the IAA exhibition in Hannover,Germany. “We are very proud of our new crane and what it can do for our customers’ business,” says Sergio Peiró, product manager, Hiab loader cranes, heavy range. The Hiab X-HiPro 1058 crane is the latest in Hiab’s heavy range segment and has been developed to meet the market’s high demands on productivity, durability and fast return on investment. The crane has a series of unique features such as new improved sequence cylinders, new tiltable stabiliser legs and a chain-driven stabiliser span, and it offers a short and fast route to working position. The capacity is 92 tonnes metre and the crane has an outreach up to 38 m vertical with a jib. The integrated subframe at the base of the crane is a brand new feature, which together with the new auxiliary legs that are fully integrated to the hydraulic and electric systems keep the time for crane installation to a minimum and ensures a perfect fit. The crane has a robust design that requires minimal maintenance and service. What is also noteworthy is the crane’s speed and precision even at full outreach. The Hiab X-HiPro 1058 includes features such as Load Stabilising System for easier and safer load handling, Pump Flow Distribution which supports the speed and precision of the crane, and Automatic Speed Control which in cooperation with Pump Flow Distribution increases capacity by 15 per cent. One other highlight is the new Variable Stability Limit + that makes working in confined spaces easy while retaining stability and high capacity. It will be possible to order the crane at the end of 2014 when it is fully launched. 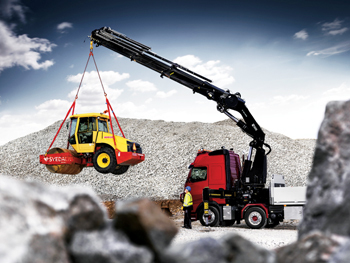 Hiab is the world’s leading provider of on-road load-handling equipment.